It is Thanksgiving week here in the US and as usual there is some tension between the materialism of Black Friday, and the spiritual considerations of gratitude and benevolence. Recently, I had what some would call a crises of faith regarding my own material needs. I’m walking the tight rope between a need to pay for the necessities of life and my sacred mission of service. In short, I think about money, or the lack thereof, a lot. Some might think that isn’t enlightened to admit publicly. I beg to differ. My witchcraft is about a healthy balance between all the five elements of life: physical, emotional, mental, will, and spirit. You know, the equal interweaving of the 5 points of the pentacle. None of that “denial of the flesh,” or “vow of poverty” bull around this witch’s cottage. Nope, we aim to “drink the good wine to the old gods” here, especially so when we feast in thanksgiving. Well, that feast comes with a price tag, so a required part of my praxis is the hard work spent manifesting the resources we need to not just survive, but thrive. The tens cards of the Thoth Tarot by Aleister Crowley and Frieda Harris. Let us not forget that the tarot deck, the bread and butter of a witches’ tool box, has an entire suit devoted to the lessons of our survival through good health and enough wealth; the job that puts food on the table and pays the doctor’s bills. In some decks that is the suit of coins, or pentacles; in my beloved Thoth Tarot deck it is the suit of disks. 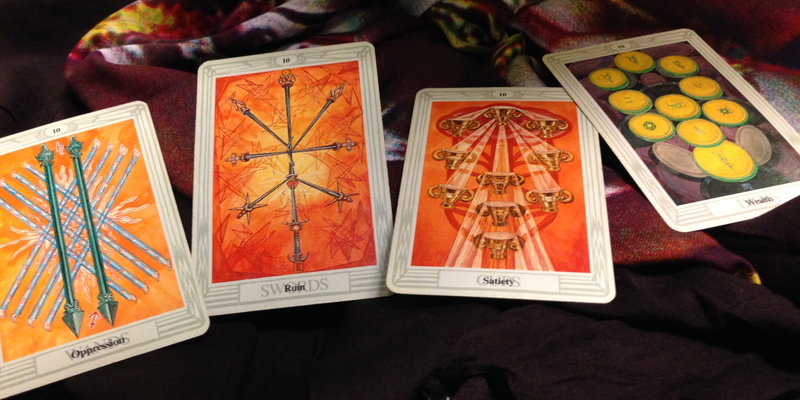 During my soul searching these past weeks, I found wise guidance through the tens cards of my deck. I recognized that the last years of my life flowed through these lessons…like a transmutation, a change from something base to something precious. A pattern in my life emerged that can be illustrated by the tens cards of Wealth, Oppression, Ruin and Satiety. Why do I still embrace this wyrdly wandering, beautiful and horrifying, rapturous and humbling path? Goooood question, my lovelies! Why, oh why, do I do this, particular, thing? Insanity not withstanding, the first answer that pops to mind is that This Thing is just who I have always been. Whether I’m *doing* the praxis, the mechanics of religion, or not, is beside the point. Frankly, I am not a person of “faith;” either I know, and I know why, or it gets none of my power. Despite what any naysayer may think, my brand of Witchcraft has no time for “superstition” but all kinds of room for mystery, wonder and poetic, mythic truth. I can hold the space for the unknown, without succumbing to irrational fears. Merry Meet Patheos, Heron here. I come before you today, pointy hat in hand, and a burning need to get some things off my chest. All you priest/esses out there, will you hear my confession? Bless me, pagandom, for I have “sinned” and fallen short of the glory of our gods; it has been two weeks since my last confession…er…post. 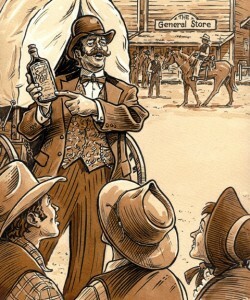 For seven years now I’ve been a merchant of metaphysical goods and services, and there are days when I feel like a snake oil salesman. I confess my disenchantment with the metaphysical industry and occasional lack of faith in my fellow practitioners. I confess that, deep down, there is a part of me still afraid of being burned at the stake as a charlatan by non-believers, and cursed into ruin by my competitors. Though my religion holds no concept of sin, it is meant to save me from this fear. For these and my many other shadows, I take full responsibility. Awen. Samhain draws closer and the witching season is in full, cackling flight. There are full moons to howl, parties to prowl, pumpkins to carve, costumes to sew, sabbats to dance, festivals to vend and initiations to attend–and that is just the next two weeks. There will be shenanigans, my lovelies! But that is only the mirthful half of the the magick that is afoot. There is much reverence on our minds as well. 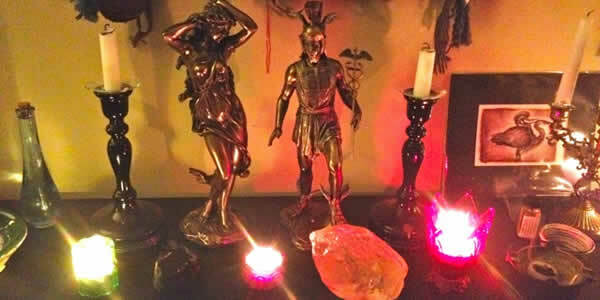 For our rites, we’ve been asked by the priestesses in charge to prepare an offering in veneration of death–a poem, a song, anything we feel is appropriate. We also will honor our beloved family members who’ve died, and so my mother haunts my thoughts again as she always does this time of year. Right on cue, my father sends me this old photo of her. It is one I’ve never seen before and far more artistic than I’m used to. This is how the messages work between us these days. With this one, I hear her reminding me that she was once young and beautiful, fashionable and adorable. At this time in her life, she was a reasonable, intelligent, Lutheran woman, newly married. 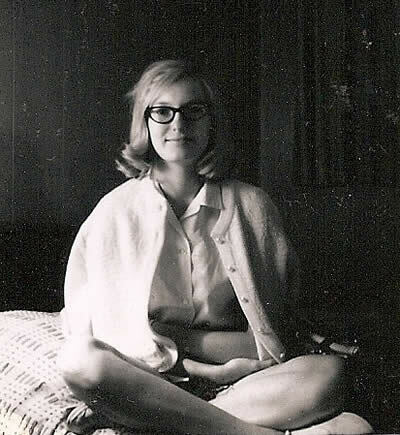 By the time she was 59 years old, she’d become more of the holy-rolling, bible-thumping, fundamentalist variety of evangelical Christian and basically the polar opposite from my liberal, feminist, witchy self. Needless to say, I didn’t talk about those things with my mother because I loved her, and I was too chicken to drop the “W” bomb. Even though she drove me absolutely bonkers, I craved her acceptance. Her love was unconditional, but the peace between us was not.